Economics and finance were subjects that I had originally neither possessed a modicum of interest in nor an iota of consideration towards. However, as I matured, and singularly focused my intellectual and physical aptitude on comprehending and solving the details of problems in seemingly unrelated fields, such as biophysics or computer science, I began to look beyond the horizons of the Protein Folding Problem, or understanding the Universal Turing Machine. As it such happened, I was recruited into Wall Street at the same time. To be thrust from a world of Laws based on first principles and experimental validation, into one of handshakes and opinion, was, well to be honest, rather enlightening. Through my subsequent years in attempting to understand an exceptionally complex system comprised of not-so-rational human participants, there has always been one central question that I have found myself contemplating at the open and close of each day: How is the world, and in particular the United States faring? And I mean this from the point of view of individuals, families, companies, and organizations. I further wanted to obtain a concrete sense of the very abstract psychological characteristics of emotion, outlook, and prospects, across what is referred to as “the aggregate”. It is particularly easy, through the internet, to obtain a heteregenous battery of opinion from all parts of a spectrum comprised of similarly diverse background and experience of those who profess particular opinions. This however falls short of my requirements of a concrete, objective measure into an invariably complex, subjective topic. I therefore proceeded to spend years and then extending beyond a decade, as any serious investor, financial market participant, or analyst would have done, by poring over various theories, reflections, opinions, “thought pieces”, and so forth. I enjoyed engaging in this investigative research because it was a natural extension of my intellectual curiosity that had in the past been expended in other sciences. The stated purpose of this article, however, is to demonstrate why the Supplemental Nutrional Assistance Program (SNAP) and (a component) of the Baltic Dry Index are the best gauges of economic comfort and activity. Let us not waste any more time, and instead address the principal components of this discourse. SNAP corresponds to the Supplemental Nutrition Assistance Program, and allow me the opportunity to access the online compendium of human intellect to introduce this program. The health of the American economy, is, without doubt, perhaps the most influential factor in assessng the health of the global economy. As an aside, I am elated that this specific article can avoid discussion of the European disaster, Japanese crisis, and hidden, or more aptly, “managed” Chinese freefall. “The Supplemental Nutrition Assistance Program (SNAP), formerly known as the Food Stamp program, provides financial assistance for purchasing food to low- and no-income people living in the U.S. It is a federal aid program, administered by the U.S. Department of Agriculture, though benefits are distributed by individual U.S. states. They can be used to purchase any prepackaged edible foods, regardless of nutritional value (e.g. soft drinks and confections). Hot foods (such as those found in a supermarket deli) are ineligible, as well as items in fast food restaurants and similar retail settings. For most of its history, the program used paper-denominated “stamps” or coupons — worth US$1 (brown), $5 (blue), and $10 (green) — bound into booklets of various denominations, to be torn out individually and used in single-use exchange. Because of their intrinsic value of 1:1 with actual money, the coupons were printed by the US Bureau of Engraving and Printing. Their rectangular shape resembled a US dollar bill (although about 1/2 the size), including intaglio printing on high-quality paper with watermarks. In the 2012 fiscal year, $74.6 billion in food assistance was distributed. As of September 2012, 47.7 million Americans were receiving on average $134.29 per month in food assistance. In Washington, D.C., and Mississippi, more than one-fifth of residents receive food assistance. This is fine and excellent, a social network intended to assist the millions of Americans in poverty. After all, as much of a “socialist”, “liberal”, “independent’, “conservative” or “libertarian” that others have claimed that I am, I also understand the fundamental truth that an individual cannot decide a priori where he or she is born. And infants, small toddlers, children, as such, are not responsible for their living standards. Let me be fully clear: I fully support helping these sorts of families and individuals. Let me be fully clear: I detest and castigate those who would abuse the system. The purpose of this article is not to debate the merits of the SNAP program, but rather, to employ it as a potent indicator of the state of the real economy. SNAP numbers, in my opinion, are exceptional in two regards. First, they differentiate themselves from seasonally-adjusted, birth-death modeled, statistically smoothed employment numbers in the same way that a slab of steak is different from processed sausage. In other words, the number of Americans or households participating in the SNAP program is about raw an economic measure that one can obtain, miraculously having had passed through the statistical machinations of a very large bureaucracy untouched. In contrast with the plethora of economic revelations continually dispensed by this apparatus, the purity of a simple measurement can be held in high regard. The second reason that the SNAP number has tremendous value is in its intrinsic ability to capture changes in real wages and consumer prices. A perennial exercise of the economic community is the computation of inflation, and this is rife with theory, discourse, conjecture eventually leading to statistical modeling that is increasingly divorced from the factual world. In the real world, as individuals and families begin to feel the pinch in declining living standards, their eventual recourse is to rely on public assistance for supporting basic needs such as food, housing, and medical care. Any perceived social stigma associated with receving this assistance varies amongst individuals and households, but we therefore can look at changes in the SNAP number as evidence of changes in the real, not modeled, economy. 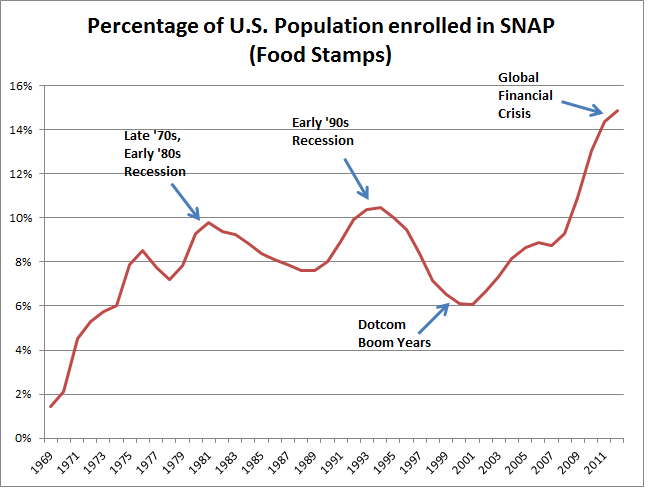 The SNAP chart indicates that an atrocious and alarming change in living standards has occurred and persisted from the mid-2000s onwards. Of course, with gasoline at nearly USD $5 in certain locales, this is rather easy to conceptualize. Perhaps given the “cyclical” booms and busts that we have been accustomed, nay, entrained, to, the initial deterioration should not have come as a surprise. Some would in fact, suggest that the period between 1978-1982 was just as intense and significant. However, the evidence that the trend has not reverted, and instead has persisted (though of a completely lower magnitude) should indeed be alarming. Governments and central banks around the world have continually proclaimed an astral “recovery” which has never manifested itself in the eyes (and bellies) of 50 million Americans. Six years after the initial precipice was encountered (I begin my enumeration from 2007), we are still experiencing economic stagnation and decline across the world, most notably in Europe, at the current moment. For how much longer can we pretend that this tectonic economic shift is “cyclical (read: transient and reverting) in nature rather than “structural” (read: permanent and continuing)? Is it not the moral responsibility of governments and other “entrusted” sources to at least make the populace aware of this transition, if not to correct it (as the causative forces are largely beyond their control at this point in history)? Most directly, the index measures the demand for shipping capacity versus the supply of dry bulk carriers. The demand for shipping varies with the amount of cargo that is being traded or moved in various markets (supply and demand). The supply of cargo ships is generally both tight and inelastic—it takes two years to build a new ship, and ships are too expensive to take out of circulation the way airlines park unneeded jets in deserts. So, marginal increases in demand can push the index higher quickly, and marginal demand decreases can cause the index to fall rapidly. e.g. “if you have 100 ships competing for 99 cargoes, rates go down, whereas if you’ve 99 ships competing for 100 cargoes, rates go up. In other words, small fleet changes and logistical matters can crash rates…” The index indirectly measures global supply and demand for the commodities shipped aboard dry bulk carriers, such as building materials, coal, metallic ores, and grains. Because dry bulk primarily consists of materials that function as raw material inputs to the production of intermediate or finished goods, such as concrete, electricity, steel, and food, the index is also seen as an efficient economic indicator of future economic growth and production. The BDI is termed a leading economic indicator because it predicts future economic activity. Another index, the HARPEX, focuses on containers freight. It provides an insight on the transport of a much wider base of commercial goods than commodities alone. HARPEX is regarded as a Current-Activity Indicator, because it measures and charts the changes in freight rates for ‘container ships.’ Container ships typically carry a wide variety of finished goods from a multitude of sellers. These are factory output goods headed for retail markets, at the other end of the supply chain. And how has this figure, that has been claimed to be “totally devoid of speculative content”, fared in recent history? This chart indicates that a disaster has occurred in the shipping industry, with rates descending beyond the trough of the 2008-2009 crisis, and reverting back to a decade ago. As a friend of mine, who is a very sharp Federal Reserve economist, recently pointed out: since the BDI index value is merely a function of supply and demand, where is the evidence that the supply of freighters has not increased? In other words, how can we not attribute the sharp decline over the past years (subsequent to 2009) to an armada of freshly minted new freighters and tankers, replete with crew, eagerly entering the shipping market? The answer to this question lies in a comprehensive examination of the annual reports of the major shipping companies (in particular, DryShips, Eagle Shipping, and so forth) since 2009. The story that will unfold is rather sad, nay pathetic, but necessary for an honest investigation into the causes of the collapse in BDI. Regardless, the drop in global shipping rates to those comparable to 2001 (or earlier) cannot be ignored, especially in the face of fuel prices that have doubled or tripled over the same period. 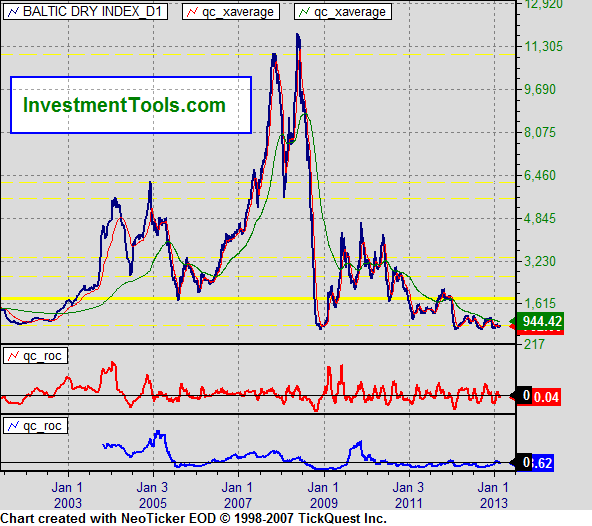 In this article, we have examined why SNAP and the Baltic Dry Index are two excellent indicators of the real, rather than a perceived, modeled, projected, or propagandized economy. There is a very lucrative trade in information, which is conducted through the well-characterized medium of the internet, in which voice, images, software, or databases are transmitted digitally across the globe. A proper, dynamic, dataset compiled sans biases would be an excellent measure of the online activity of the world as a whole, but this would lack in conveying the “principal components” that a trader, investor, or asset manager would be interested in: a current quantification of a prominent nation’s ability to maintain living standards, or a measure of physical goods exchanged globally. We cannot rely on official government figures any longer, as these have been abused for decades and the collapse in their credibility has been well-documented throughout both the ethereal internet and varnished peer-reviewed literature. This entry was posted in Uncategorized and tagged Baltic Dry Index, Economy, Global Financial Crisis, Global Trade, Recession, SNAP on February 28, 2013 by Srikant Krishna.